Laguna Hills, CA – Wonderful emotions filled the living room yesterday during an early spring training game at Camelback Ranch in Glendale, AZ. This new facility is home of the Los Angeles Dodgers organization and their new skipper, Don Mattingly, to prepare for the grind of a new season. Kansas City Royals players, led by Ned Yost, took on the Dodgers in front of a few thousand on hand at the new ballpark but many more fans listened, watched or simply followed the game with their own personal attachment to specific players. Of course the outcome of slapping hands and butts on the field after a win is nice but the goal is to stick with plans of development and preparation for the season ahead. 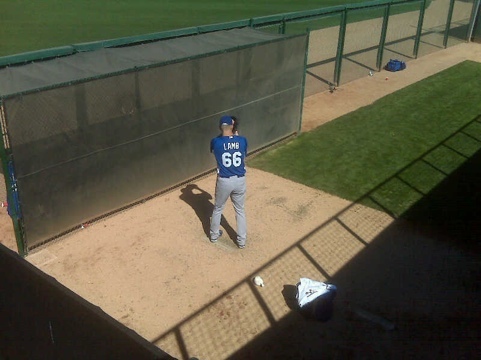 By now you should be fully aware of the connection to John Lamb and the joy we have been fortunate to experience during this early part of his professional baseball career. The Kansas City Royals have blessed my son with opportunity and he continues to take advantage of the surreal experiences during his journey. The first time for anything can bring on many types of emotions. Family and friends share these unique bonds of emotions during any athlete’s performance whom they have special attachment. I was very anxious, nervous and happy to see him pitch during the fifth inning of Wednesday’s game. The height of my adrenaline boost followed the delivery of the third pitch to the first batter as he returned to the Dodgers dugout with the first of three strike-outs John would record in the inning of work. Your firsts can be only one thing…good or bad. This first for my son was good but John remains level-headed after the one inning appearance. He fully enjoys the good and the optimism poured from his voice on the phone but he also knows the humility the game of baseball can quickly give. John will take this performance in stride and know the areas that need extra work before his next game assignment on March 7, 2011. The noted date is purely an educated guess by this Dad. Lamb recorded 3 Ks, 0 BB, 0 R and allowed only 1 hit which was a double to the second batter of the inning. A good day of work for the 20 year-old lefty surrounded by the best minor league system in professional baseball according to Baseball America. Yesterday’s work for John Lamb and fellow Royals teammates, no matter what the result, simply exposed areas that need improvement. John admitted it was the first time he let it go, per request by club, and having a “horrible bull-pen.” He was relieved to work and contribute with three outs for the team. Plenty of work lie ahead for the young left-handed pitcher during his third spring training and first as a non roster invitee, if you really watched the performance. Not ignoring the results were great but John is fully aware of the continued need for adjustments and I’m sure he will work hard to make some slight corrections with the Royals coaching staff. There are more long days ahead during this spring training experience for all young men in professional baseball. An early spring training game is not going to align the stars for a perfect season but it’s nice to see some of the youth having temporary success during this part of development. The Lamb family is only one of many families smiling over their son’s current situation in professional baseball. The Royals will see success sooner than most forecast. Extras – What were your feelings watching your favorite, or special, player work during a spring training game? Jeff Montgomery had some very nice things to say about John on WHB today. You might want to go to http://www.810whb.com, click on podcasts and listen to Montgomery’s comments. Thanks for the link and visit…I will listen a little later today. Was very excited to know that MLB Network aired the game Wed. night so I could have a chance to see John pitch. John looked very much in control. So many great things have been said about John and what I saw only backed them up. If I’m this excited to see John pitch, I could only imagine a father’s emotion. I’m a BIG fan of John. Yes…very exciting to see John have a good outing last week and glad the Royals played the Dodgers to get a home town broadcast in the home. I admit my eyes had some extra moisture and it really was a challenge to see clearly. Glad we have the game on our ATT box to watch as often as we want.